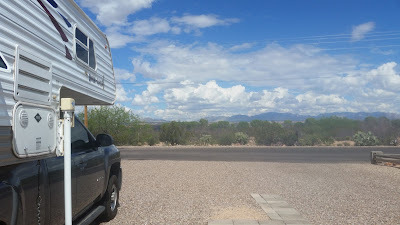 I transitioned from complete off the grid boondocking on BLM land at Indian Bread Recreation Area to the full amenity hookups at the Escapee's Saguaro Co-Op in Benson, AZ. The Saguaro Co-Op check-in office. The reason I made this move was two-fold. First Benson is the closest town of any size to Indian Bread rec area and after a week there some of the Tank's supplies needed restocking. 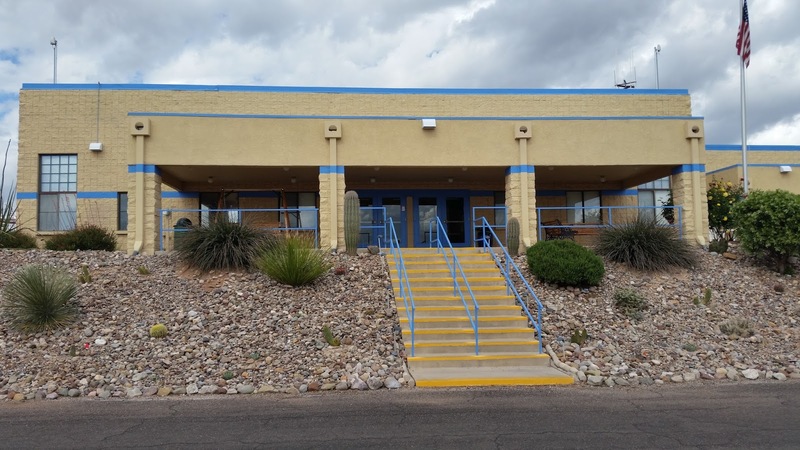 The second reason was that the Co-Op offers a tremendous first visit deal to Escapee's, seven days of full hookups and use of their facilities for $50.00! (I'm uncertain if non-members can get the same deal, call ahead and ask.) The hookups even include free cable and the RV park has very strong WiFi that was more than usable. For less than $8 a day you can't beat this deal anywhere. The view from the Tank's site at the Co-Op. 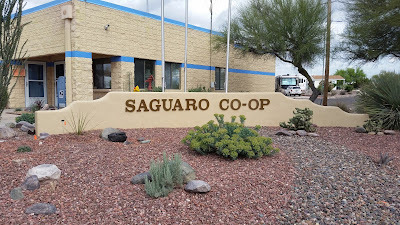 The residents at the Saguaro Co-Op are like Escapee's everywhere, uniformly friendly and older than me and they really welcome renter's because the rent goes into a master fund that defrays any annual assessments the residents may incur like road repair or storm damage repair, etc. The Welcome Lady (every Escapee facility has one) who comes by the first day to explain the Co-Op and tell you about the facility only put the mildest of sales pitches on me in encouraging me to get on the Co-Op's wait list to buy a spot in the Co-Op when it opened up, no time-share type grilling. I figure I have several years of full-timing in me before I "settle down" so I politely passed on putting down the $500 refundable wait list deposit, but she did mention the list was 275 names long! The Co-Op clubhouse. It even had a workout room with weight machine! In my exercise walking around the quiet streets of the Co-Op (speed limit 15 mph) I was struck by how meticulous the grounds were kept, both resident's sites and the common areas. 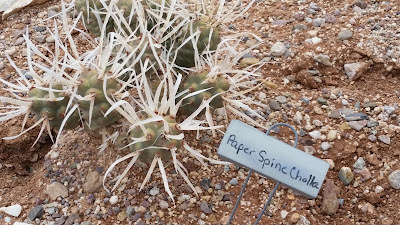 Almost every plant in the landscape schemes had hand lettered little name plates telling you the name of the plant which was kind of cool! A cactus in one of the public areas with it's name plate. As the Co-Op is in the middle of the desert a few miles south of Benson the landscape scheme centers around desert plants and stone, I don't remember seeing a single blade of grass but the whole place was very attractive with the mountains in the background. I enjoyed the luxury of having hookups and exercise facilities for a week at the Saguaro Co-Op and would recommend taking advantage of their tremendous first visit offer. You DO have to pay for your electricity but my heavy usage only came to $3.75 for the whole week so no big deal there.